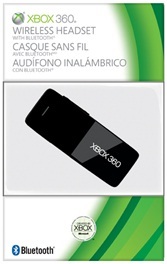 You can chat with friends on Xbox Live using the Xbox 360 Wireless Headset with Bluetooth. Use the headset to chat on Xbox Live, or switch to Bluetooth mode and use the headset with a Bluetooth-enabled device such as a mobile phone or PC. Bluetooth mode is only for operation with Bluetooth devices. Learn how to connect the wireless headset to a Bluetooth device. See the “Video tutorials” section at the bottom of this article to see Bluetooth setup and use in action. For warranty information about Xbox accessories, including the Wireless Headset with Bluetooth, see the Warranty and service: FAQ. 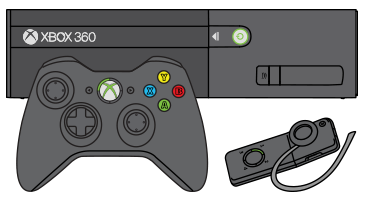 The easiest way to install the Xbox 360 Wireless Headset (with Bluetooth) software drivers is to connect to Xbox Live. If your console is connected to Xbox Live, skip to step 2. If your console isn’t connected to Xbox Live, you can download the latest console software to your computer and install it on your Xbox 360 console. For the steps on how to do this, see How to get a new Xbox 360 update. Plug the charging cable that’s included with the headset into a USB port on your console. There are two USB ports on the front of your console behind an oval door. Connect the other end of the charging cable to the headset’s power input. This is the smaller connector. The lights on the headset flash green while charging in Xbox mode, and flash blue while charging in Bluetooth mode. Once charging is complete, the light will stop flashing. The headset isn’t functional when connected to the headset charging cable. The headset charges in either Bluetooth or Xbox mode. Some limited edition versions of the headset include a charging cradle. When the headset is in the charging cradle, the light on the cradle flashes during charging and stops flashing once the charging is complete. The easiest way to connect your headset to your console by charging the headset, shown in step 2. If you’ve done this, unplug the charge cable from the headset and skip to step 4. Move the mode switch to Xbox (Green) on your wireless headset. Press the power button on the headset for two seconds. The lights will flash green. After the headset plays the startup sound, press and hold the headset’s connect button for two seconds. Within 20 seconds of pressing the connect button, press and release connect button on your console. The lights flash green three times once your headset is connected to your console. Your headset will now automatically connect to your console whenever you turn on your headset in Xbox mode. Note If your headset doesn’t connect within 20 seconds, the lights resume flashing slowly. If this happens, repeat steps 4 and 5. The headset can take up to 10 seconds to connect to your console. 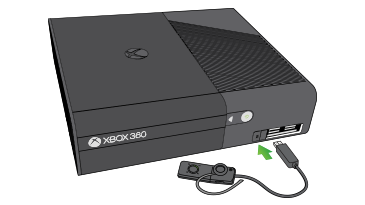 On an Xbox 360 S console, the headset is assigned a position on the ring of light around the console’s power button. Each connected controller is assigned to one of four positions, and each controller can have an associated headset. 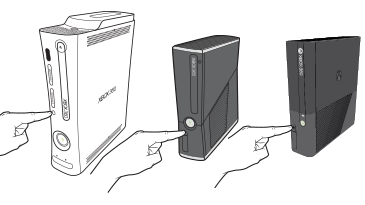 Note On an Xbox 360 E console, you can determine the controller’s assignment by looking at the ring of light around the Guide button on the controller itself. If a controller is assigned to position 1, then the wireless headset is also assigned to position 1. If another headset is already assigned to position 1, your headset is assigned to position 2. If you want to change the position assigned to a headset, press the headset’s connect or power button to advance to the position you want. For example, to change a headset assigned to position 1 to position 3, press the connect or power button twice. Note For help with this, see the “Assigning the wireless headset to another controller” video in the “Video tutorials” section at the bottom of this article. You can connect up to four wireless headsets to a console at one time. Make sure there is an available (unlit) section on the ring of light, before you connect your wireless headset. If you want to connect multiple controllers and wireless headsets, connect a wireless headset first, then the corresponding controller. A wireless headset can’t be associated with a controller that’s connected to a wired headset. To use a wireless headset instead, unplug the wired headset and then repeat the wireless connection steps in Step 3: Connect your wireless headset to your console. A controller is not required for the headset to work with the console. Your headset can connect wirelessly to only one console at a time. You can connect to a new console at any time, but your previous connection will be lost. Before you use your wireless headset, you may need to swap out the ear gel for another size. Three ear gels in different sizes are included with your headset, so you can choose one that’s comfortable. Remove the included ear gel by gently pulling it off the speaker. Select an ear gel, center it over the speaker, and then gently push the gel until it snaps into place. The surface of the speaker is slightly recessed below the lip of the ear gel. Press the power button on the headset for 2 seconds to turn it on. Hold the headset in one hand with the speaker facing you. With your other hand, hold the ear loop and snap the loop into place at the base of the speaker. The ear loop is reversible, so you can wear the headset on your left or right ear. Fit the headset over either ear so that the ear loop hooks over your ear and the ear gel rests comfortably in your ear. If the headset isn’t comfortable, take off the headset and try using a different ear gel. The ear gel is designed to sit outside the ear canal. Once the headset is comfortably on, adjust the volume, and start using your headset. For the best microphone performance, make sure the headset points towards your mouth and is positioned as shown. Press the power button on the headset. The wireless headset works within 30 feet (9 meters) of the console. Objects between the controller and the console can reduce this range. If you can’t hear someone when using in-game chat or private chat, see Troubleshoot problems with Xbox Live chat on Xbox 360. When you are done using the headset, press and hold the power button to turn it off. Turning off your console doesn’t turn off the headset. To adjust the volume, press the Volume Up or Volume Down button. Press the Mute button to toggle mute on and off. You can only mute your headset in Xbox mode. Note To see a video tutorial that shows how to mute your headset, see the “Video tutorials” section at the bottom of this article. Clean your headset with a dry cloth. Cleaning solutions may damage the headset. Don’t allow the headset to get wet. If the headset charging cable is connected to the headset and the battery fails to charge, the headset’s first two lights will flash in sequence (1, 1 and 2; 1, 1 and 2; and so on). Leave the headset connected for a while to see if the battery charges normally. If the lights on the headset continue to flash, contact Xbox Support using the Assistance information at the bottom of this page. When you receive an incoming call, the headset plays an incoming-call sound, and the headset’s lights flash blue until you answer, reject, or tell the phone to ignore the call. Press and release the Action button. If the headset is in Xbox mode, switching to Bluetooth mode automatically answers the incoming call (without you pressing the Action button). If the headset is turned off, turning it on will automatically answer an incoming call (without you pressing the Action button). To reject an incoming call: Press and hold the Action button for two seconds. Press and release the Action button to hang up the active call. Press and hold the Action button for two seconds to swap calls. Turn on your wireless headset. If your headset is connected to a Bluetooth device (and not already in a call), press and hold the Action button for two seconds. Use Bluetooth voice commands to make your call. For information about Bluetooth voice commands, refer to your Bluetooth device instructions (for example, your phone documentation). Note The mute button on the wireless headset only works in Xbox mode. However, if you’re using the headset with a mobile phone, you can use the mute function on your phone. You can switch the operating modes on your headset at any time. If you have a Bluetooth device that supports calling, you can switch from Xbox to Bluetooth mode to answer an incoming call on your headset (provided you have previously set up the Bluetooth device with your headset). If you switch from Bluetooth back to Xbox mode, your headset uses the same settings you had when you last used Xbox mode. When 30 minutes of time remains: Lights flash about twice per minute until 5 minutes remain. When 5 minutes of time remains: Lights flash continuously until the headset shuts off. Mobile device connectivity problems vary by manufacturer. For help troubleshooting Bluetooth connectivity problems with a mobile device, see the product manual or the manufacturer’s website. For help connecting your headset to a Windows Phone, see Pair my phone with a Bluetooth accessory. Complete the setup steps to connect your headset with your Bluetooth device. Make sure the microphone is pointed forward. Make sure the Bluetooth mode on your Bluetooth device (for example, a phone) is on. Move the mode switch to “Bluetooth” (the light on the headset will flash blue). Press and hold the Connect button for 10 seconds. Initially the lights will flash blue in a clockwise direction, and then after 10 seconds all four lights will flash together. The headset will also make two low-pitch sounds. To pair the headset again see “Step 3: Connect your wireless headset to your console,” above. If the information in this article does not solve your problem, contact Xbox Support by clicking the “Contact us” link at the bottom of this page. Note The following video tutorials are available in English only. How to set up the wireless headset with Bluetooth. Watch the video How to set up the wireless headset with Bluetooth. Note This video is available in English only. Watch the video Using your headset with other Bluetooth devices. Note This video is available in English only. Watch the video Clearing the headset of all Bluetooth devices. Note This video is available in English only. Watch the video Muting your wireless headset in Xbox mode. Note This video is available in English only. Watch the video Assigning the wireless headset to another controller. Note This video is available in English only. Would you like to contact Support regarding the "Set up and use the Wireless Bluetooth Headset with an Xbox 360 console" issue you were reading about or a different issue?